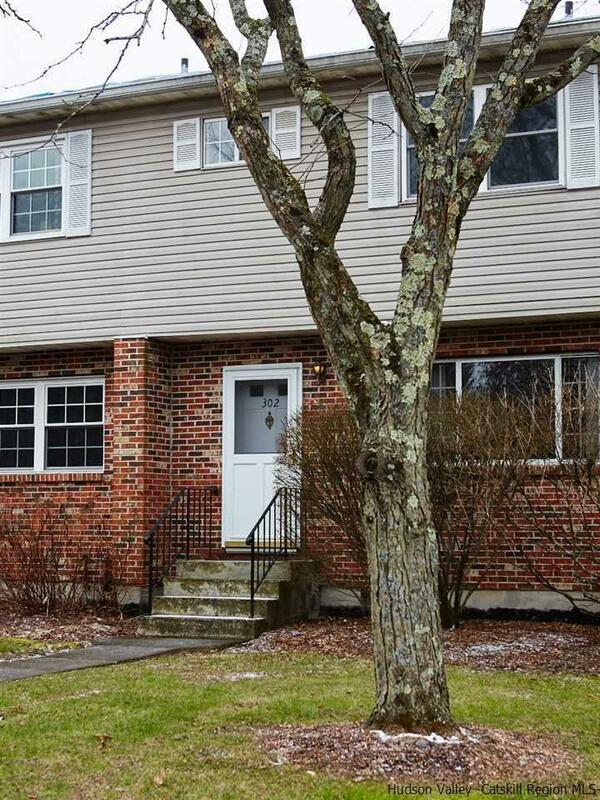 NEW PALTZ VILLAGE TOWNHOUSE - Come tour this Briarwood townhouse located in the heart of historic New Paltz. Downstairs you'll find a large living room with a picture window overlooking the tree-lined street, a half-bathroom for guests, a dedicated laundry room with shelves for supplies, and kitchen with breakfast bar looking out to the dining room. French doors off the dining room lead to a cozy back deck for dining al fresco and entertaining. Follow carpeted stairs up the skylit stairwell to the second floor where you'll find a full tiled bathroom with tub, linen closet, master bedroom with walk-in closet and master bathroom with stand-up shower. Second and third bedrooms overlook the back deck with windows that let in plenty of light. The storage shed off the back deck offers storage with shelving for outdoor equipment, and a central heating and cooling system keeps this townhouse comfortable year-round. From this location, everything in downtown New Paltz is at your fingertips: Elting Memorial Library, SUNY campus, Moriello pool and park, bus station, dining, drinks, shopping, and galleries. Enjoy easy access to the Wallkill Valley Rail Trail and the new River to Ridge Trail for recreation at nearby Minnewaska State Park and Mohonk Preserve.